I shall love you only more, never less, till I’m gone. You are my creme brulee! Preheat oven to 300° F. Have ready a flame proof 1-quart shallow baking or gratin dish ( I have used smaller ramekins) and a roasting pan. Put on a kettle of water to boil for the water bath. Heat the cream, and half-and-half in a medium saucepan over medium heat until hot. Remove from the heat. Whisk together the yolks, ½ cup of the sugar, and the salt in a medium bowl. Slowly add the cream mixture, whisking constantly until blended and smooth. Do not over mix it. Add the vanilla. Pour the mixture through a fine strainer set over a medium glass measure or a bowl. Pour the custard into the baking dish, and skim any foam from the top. Transfer to a roasting pan, place in the oven, and pour enough boiling water into the pan to reach halfway up the sides of the baking dish. Bake for 25-30 minutes, or until custard is set around the edges but still slightly jiggly in the center. Do not over bake--the custard will set further as it cools. Remove the baking dish from the water bath and let cool completely on a wire rack. Refrigerate the crème brulee, loosely covered, for at least 4 hours, until thoroughly chilled and set, or for up to 1 day. Preheat the broiler. Have the roasting pan ready, and fill bowl with ice water. Gently blot the surface of the custard with the edge of a paper towel to remove any condensation. Sift the remaining ¼ cup sugar evenly over the custard. Place the baking dish in the roasting pan and carefully pour enough ice water to come halfway up the sides of the baking dish. Broil custard about 3 inches from heat for 2-3 minutes, until sugar has melted and turned a dark amber color; carefully move or rotate the dish if necessary so the sugar caramelizes evenly. Remove from the broiler, and cool the custard in the ice water for 5 minutes. Carefully remove the baking dish from the pan. Serve right away, or refrigirate, uncovered for no longer than 1 hour before serving-- or the topping will soften. Recipe adapted from Luscious Creamy Desserts by Lori Longbotham and France Ruffenach. I love this book, I have my eyes on many more recipes to try. Your creme brulee does look absolutely luscious. 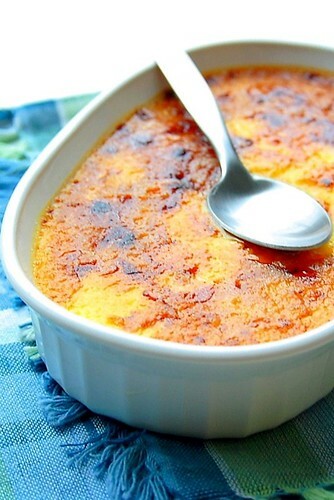 I'm always up for a good classic creme brulee recipe, so I can't wait to try this one! prekrasna posveta:)) i odlična krema! 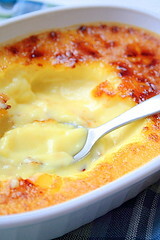 Ive always wanted to try making creme brulee, and your pic makes me want to get started! Looks great! Thanks for sharing! oh girl, that is so sweet, I mean your dedicatory to your *creme brulee*. I call my man *mon calisson* which is a specialty french candy from Aix-en-provence, his hometown. Oh, and btw after all this gossip of mine, I love creme brulees specially family style and not just in their single ramekin portions. And as usual your pic is awesome! Wow, it looks delicious! Would you believe I have never eaten creme brulee?! I'm using google translate, but not much is understood. You are a poet as well as a great cook! Delicious looking creme brulee. Oh my that creme brulee looks amazing. Thank you for sharing the recipe! Predivno napravljeno,nisam ga do sada radila,pa cu probati po o vom receptu! creme brulee je san snova, tako jednostavan, a tako dobar! Oh yes, that is luscious!